Entonces, pensé: ¿por qué no mezclar mis nuevos jeans con mis sandalias con ojetes también? Sí, un montón de eyelets en sólo un outfit, y me encantó! Los jeans son todo en mi vida, son como nuestro mejor amigo que nunca nos decepcionará! Para las chicas bajitas como yo, los jeans a la cintura son el mejor truco para vernos un poco más altas y hacer que nuestras piernas se vean más largas también. Estos jeans me quedaron perfectos y también se ven muy cool con un crop top o algo más cortito y apretado. Sin embargo, en el outfit de hoy decidí traer de vuelta a la vida de mi camisa de seda de BOW! y darle al look un toque más simple. ¿Que les parece? Estoy ya en modo desesperado por el invierno chicos porque el verano ya me está molestando demasiado con tanto calor en esta ciudad. Si me siguen en Instagram @ fashionismygf, probablemente ya han visto mis escapaditas a la playa algunos fines de semana, pero nunca es suficiente! Me gustaría poder estar allí todo el verano y volver cuando hace frío, jaja. Me entienden? Espero que hayan tenido un fin de semana genial y que estén teniendo un domingo bien flojito! Estoy muy contenta de haber vuelto a tener una constancia más decente con el blog y espero seguir haciéndolo así, ya que es mi hobby número uno! 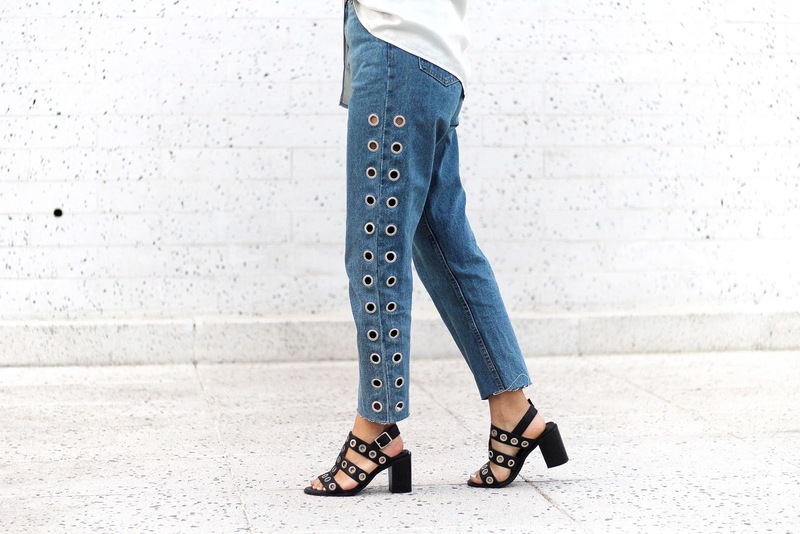 So then, I thought: why not mixing my new fave eyelet jeans with more eyelets? Yep, lots of eyelets in only one outfit, and I loved it! Jeans are everything in my wardrobe, they're like our best friend who will never let us down! For petite girls like me, high waisted jeans are the best trick to look a bit taller and make our legs look longer. This jeans fit perfectly and also look amazing with a crop top. However, on today's outfit I decided to bring back to life my silky shirt from BOW! and give the look that simple touch with it. I really can't wait for winter guys because summer is just being too annoying and hot in the city. If you follow me on Instagram @fashionismygf, you've probably seen I've run away to the beach some weekends but it's never enough! I wish I could stay there all summer and come back when it gets cold, haha. Does anyone feel the same? Hope you had an amazing weekend and are having a lazy Sunday! I'm very glad I'm back on track with the blog and I hope to keep doing it like this since it's my hobby number one to share my stuff with you! In the year of 2017. People around me suddenly begin to hang out with black v neck dress.I'm feeling curious and suspicion at the moment:"Is this a thing now? "And here's my thoughts after research and the dress that I bought.